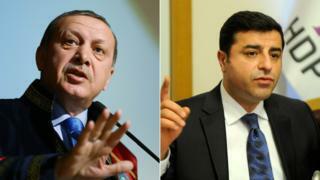 Image caption Recep Tayyip Erdogan (left) has warned Mr Demirtas he would be "taught a lesson"
Turkish President Recep Tayyip Erdogan has condemned as "treason" a call by prominent Kurdish politician Selahattin Demirtas for Kurdish autonomy. "What the co-leader has done is treason, provocation," Mr Erdogan said, referring to Mr Demirtas, co-leader of the Peoples' Democratic Party (HDP). At the weekend the HDP and other pro-Kurdish groups called for self-rule in Turkey's mainly Kurdish south-east. Turkish prosecutors have launched an investigation into those comments. The Turkish military has stepped up operations against the rebel Kurdistan Workers' Party (PKK), which is fighting for Kurdish self-rule. The army says it has killed more than 200 PKK militants in the latest fighting. The PKK is regarded as a "terrorist" organisation by Turkey, the US and EU. The HDP won 59 seats in Turkey's 550-seat parliament in the 1 November elections. It came third, behind Mr Erdogan's Justice and Development Party (AKP) and the Republican People's Party (CHP). Speaking on Tuesday, Mr Erdogan said Mr Demirtas and other Kurdish leaders would be "taught a lesson" by the people and the law. He accused Mr Demirtas of challenging Article 14 of the constitution, which bans activities deemed to "violate the indivisible integrity of the state". On Sunday Mr Demirtas backed a declaration by a Kurdish umbrella group - the Democratic Society Congress (DTK) - which called for "autonomous regions" and "self-governance bodies". The AKP has taken some steps towards improving the cultural rights of the Kurds, including on the official use of the Kurdish language, during its 13-year rule. But many of the Kurds' demands, such as the right to an education in Kurdish, have not been met. Self-rule has been discussed for decades. The idea is now being promoted by a legitimate political party, the HDP, and the umbrella organisation DTK. But with the recent upsurge in fighting in Turkey's mainly Kurdish south-east - with government-imposed curfews and Kurdish militias fighting in the streets - there is little room to talk about rights. The declaration, issued in the mainly Kurdish city of Diyarbakir, said the "rightful resistance" of Kurds against Turkish state policies "is essentially a demand and struggle for local self-governance and local democracy". It called for the "formation of autonomous regions, to involve several neighbouring provinces in consideration of cultural, economic and geographic affinities". The PKK has been battling the Turkish military for three decades, in a separatist conflict that has killed more than 40,000 people.